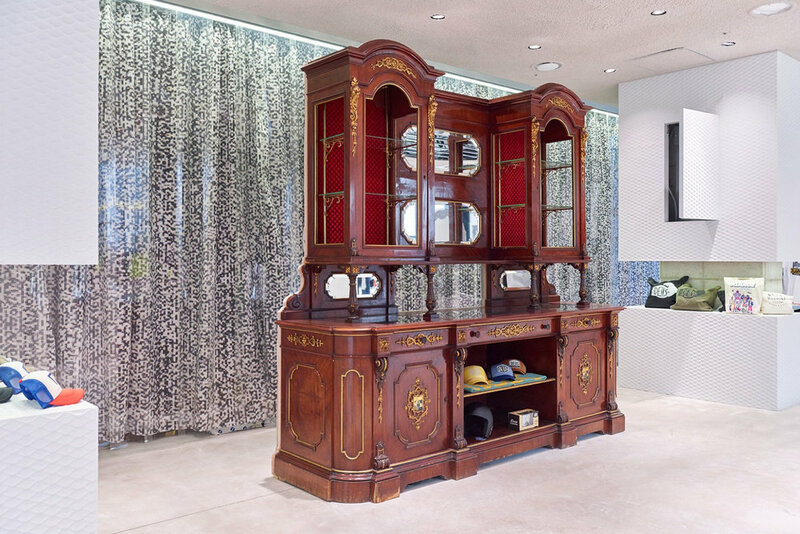 Compared to its more restrained compatriot to the East, which has a heady indulgence in refined luxury, Korean brands are pushing the envelope in all realms of creativity from the actual garments and accessories on sale to the decor of its stores. As the most connected nation, South Koreans are uniquely plugged into a world of infinite inspiration, allowing creatives to meld concepts and approaches from overseas into a hyper unique style. Considering that the nation is also obsessed with its looks and image, it’s clear that having the right concept and image is innately important here. We take a look at how the creative ingenuity of some South Koreans has resulted in the creation of truly stunning retail concepts. Gentle Monster’s ornate installations are scarcely comprehensible without a written guide. At its many boutiques, it is where high art meets high fashion. Bordering on the insane, its artistic direction is evocative of the glasses that it is hawking - everything about the brand is meant to be a work of art in and of itself. At the centre of the Gentle Monster empire stands its twin flagships in Gangnam’s Sinsa-dong. The main Sinsa store routinely reinvents itself shedding previous concepts for a new skin, though none should be considered as less than the rest. The store in its current form hosts an wondrous narrative where a host of crows battling against an unidentified alien invader. It’s an all enveloping visual (and oftentimes) sensory experience. The Sinsa Parallel sister outlet rarely changes its character instead serving as a site for rare or out of collection frames. That’s incentive enough to visit the store if not for its immaculately presented (and maintained) storefront. When we visited, the Sinsa Parallel store hosted the label’s ‘normal' frames whilst the main store only stocked its sunglasses collection. A stone’s throw away is the label’s BAT project space where it has yet another rotation of visual treats each with its own intellectual interpretation of life, fashion and culture. It’s a great space for Gentle Monster to showcase the works of great independent artists or small boutique firms with grand artistic visions. Elsewhere in Seoul, Gentle Monster’s stores in Hongdae and Bukchon are also exquisitely decorated. While other more conventional companies are cutting back on their retail spaces as they continuously view them as money draining ventures, Gentle Monster thrives on having an established retail presence in the real world. Unlike trips to the supermarket out of necessity, shoppers head to Gentle Monster’s boutiques out of purpose - to check out the store’s latest zany installation or to (after being suitably inspired) actually buy a pair of glasses. The latter is always seen as a secondary objective for the company, the first is always to dazzle. It also helps that the interiors are immensely popular on Instagram. Obviously, while the purpose of having such an abstract use of visual merchandising is to draw in an aspirational crowd, Gentle Monster is made out of both style and substance. Leveraging its creative spin on design, the company embraces tastemakers and intellectuals to design its spaces with a specific idea behind it. For example, its Singapore store is a representation of Frederick Nietzsche’s treatise ‘Thus Spoke Zarathustra’. Apart from the central ideas of the text being clearly seen in the store (the yarn and its showy representation of the circularity of life), Gentle Monster also reaches out to familiar motifs within Nietzsche’s ‘camel, lion and child’ metamorphoses to complete the experience. And then we come to the spectacles themselves. What’s better is that Gentle Monster’s frames are made to fit an Asian face as the rubber nose pads are configured for the lower nose bridges of Asian faces. For sunglasses without this feature, frames are constructed such that it always stays where it’s meant to be. This means that your frames aren’t always looking to slide off your nose. Many praise the industrial design of their circular frames while others fall head over hells for their more solid (and definitely heavier) pieces. There’s certainly enough styles to go around, and to fit any preference. Then there also the statement pieces that have characterised the brand from the get go, from quirky pencils attached to the top of frames to more wacky spectacles that feature face-sized (yes you read that right) lenses. Considering that it’s already been proven that as consumers we all buy into brands that represent our inclinations and desire, unseating Gentle Monster from its masterful execution of art won’t be an easy feat. It’s more than just a pair of well constructed glasses, it’s the name and idea that the brand name exudes. If you’re ever in a city that has the privilege of hosting a Gentle Monster store, do yourself a favour and check it out. You won’t be making a wasted trip. With stores in Itaewon and Hongdae, Ader Error is similarly pushing the boundaries of retail. It’s unique approach to visual merchandising draws inspiration from a variety of influences that are regularly curated by a team that doesn't reveal its identity. Understandably, the brand adopts a visual approach to marketing its products be it through their own hyperstylised Instagram feeds, or by visitors snapping Instagram stores and photos of their uniquely decorated stores. No matter whether you’re visiting the flagship in Hongdae or the showroom outpost in Itaewon, eccentricity rules the day. Despite being off the main thoroughfare of these two districts, ardent fans are all too happy to make the trek up to these shining outposts. The brand is also known for producing seemingly unrelated products (to fashion that is), from paper cups to pin badges. It’s hats and socks however, still remain as its most popular products. These small accessories however, are huge influences on what goes onto t shirts and sweaters, and how pants and overcoats are structured. Everything is meant to go together, like the huge idea board that is drawn up before a collection is conceived. Every collection is made with a shared vision, and is one that is continually refined throughout the process from the visual stylisation of its stores to the specific shades of colour that appear on Instagram. ADER Error is after all, a collective of inspired Seoulites decided that it was high time that a Korean born, norm challenging apparel (with quirky retail interiors and design) appeared on Seoul’s streets. All of Ader Error’s clothes are unisex, challenging a traditional redline that stands for gender, especially in Asian societies. Korea however stands at the forefront of a clash in ideals, between the older generation that still believe in conservative ideas of the individual and the society and the younger generation where fashion and beauty are to be enjoyed by humans, not genders. Its global success however lies with more simple reasons. The brand simply appeals to the creative spark in those who wear its clothes, speaking to photographers with its unique angles and stylists through its unique retail sets. After all, the seemingly playful yet still carefully considered reinvention of classic fabrics and styles are inspiring in and of itself. Apart from being stars on virtual Instagram runways, Ader Error’s clothes have been consistently praised for its durability and high quality construction. Indeed, significant thought has not just gone into apparel looks but also to the type of materials used. For example, Ader has said in some pieces, it augments run of the mill cotton with a special blend that prevents tees and hoodies from wrinkling. Seoul’s Queen Mama Market is more than just a collection of well curated household and lifestyle goods. Through its strategic placement of its goods, shoppers are guided through a series of installations that mimic the philosophies of the various brands found within the space. The market’s curators routinely rotate the style of its ‘main hall’ on the ground floor whilst it gives select brands free rein to influence the layout of its smaller spaces on the 2nd and 3rd floors. We were especially enamoured by the aircraft meal carts that were on sale by OhBoy! on the second floor. At Queen Mama, one never knows what you’re going to walk out with. Head into the store for books on photography and you might just emerge with a wheelbarrow full of perfume and hand soaps. We’ve seen beautifully designed radios and speakers that have a vintage inspired design. 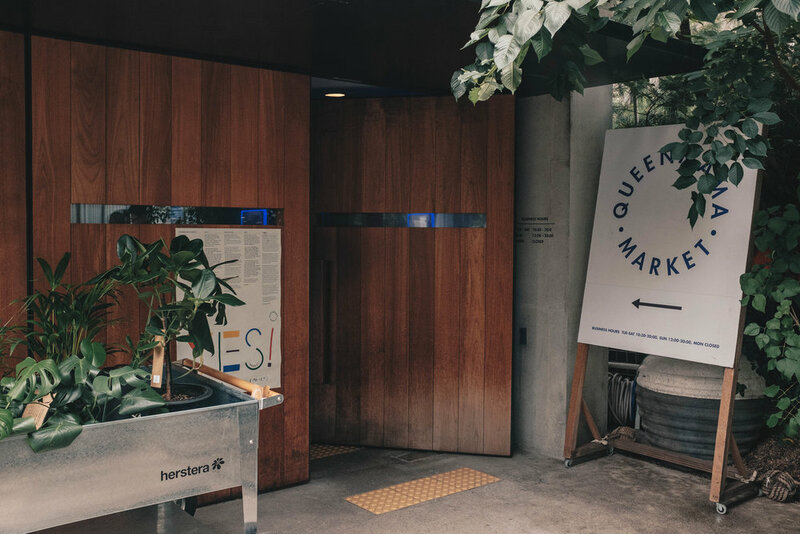 From what we’ve said about Queen Mama, it’s clear that design sits at the forefront of its stores and products much like the Good Design Store in Tokyo’s Kitte Mall. Not only is the presentation of products imaginative, the products themselves are oftentimes well designed everyday items (originating from around the globe). Founders of Queen Mama, Jinyoung Kang and Hanni Yoon both share a passion for good design especially since it has the power to really delight. On the top floor of Queen Mama Market sits Manufact Coffee Roasters which has modelled the space no less expertly to its brethren on lower floors. The space is inviting with less greenery gracing its short benches and workspaces. Different coffee origins and styles are also feature prominently. Apart from this, the general vibe of the cafe whispers industrial chic though subtle design elements like the colour of its wooden long table tones down the oftentimes dilapidated appearances of fully industrial cafes. Manufact is a modern design lover’s (not to mention coffee enthusiast) heaven. Walking past, one might mistake the towering edifice of Queen Mama Market to be yet another monolithic private space for the rich and famous - it is after all, Cheongdam-dong. Yet, Queen Mama’s goods are surprisingly affordable (especially when they’re on sale) especially if you know where to look. They’re all high quality goods anyway. And so, if you do find yourself walking along the glitzy streets of Apgujeong, pin Queen Mama Market on the map - it’s not to be missed. Famed for its millennial pink interior, the stylenanda family of brands is most well known for its flagship store in Myeongdong. Don’t be fooled by its somewhat kitschy exterior however, as the 6 storey building houses a hotel, pool, retail shop (clothes and makeup) plus a cafe to boot. All of this is part of the brand’s effort to provide a one-location representation of its design aesthetic and its overall interpretation of Korean fashion and culture. It’s name after all, was taken by a common used Korean slang to describe ‘stylish girls’ around the start of the millennium. It also roughly translates to ‘I am style’. In a world where Korean school students are pushed to the edge in school, the last thing a brands is to hawk its product in a detached and sterile manner. Stylenanda therefore deliberately (and it shows) stylises its stores to make shopping feel like a carefree activity, one to indulge in to release the stress of ‘ordinary life’. That’s how the rooftop pool and wondrous cafe was born. All aspects of the building’s interior design screams of a very distinct use of colour from the bright pinks that adorn most of the walls to the marble and earthtone greens of the sofas. While you wouldn’t mistake the hotel for a Wes Anderson styled establishment (like the Grand Budapest), it certainly takes some form of inspiration from his unique stylisation. Riding on this considered approach to design are a host of affluent and trend hungry shoppers that loathe to be seen as ‘out of fashion’. This is very much so in South Korea, a country touched by rapid economic development so quick that it didn’t have the time to find its own unique idea of what a baseline Korean fashion is. That’s not to say that there isn’t one, it’s just that what’s hot relies inordinately much on trends and hype. Stylenanda also finds its uniquely poised to ride the Kwave that has for the past decade, swept across Asia and just now, has reaching the shores of the United States. Representing everything from K-Pop to boutique fashion labels and even makeup brands are essentially to the world of Stylenanda. If Ader Error was the Vetements of Korea, Stylenanda certainly is its Glossier. And while the millennial pink and desaturated colour palette may just be a trend that will like all others, fade away, it’ll be interesting to see how stylenanda reinvents itself for the future - its execution now is pretty flawless anyway. If you’re not convinced, don’t take our word for it, the maestros over at L’Oreal recently made an outright purchase of stylenanda - the mega brand’s first major foray into the Korean beauty market. At its two impressively large locations, WORKSOUT is a veritable streetwear Mecca for both Seoulites and international visitors. Carving out a space for uniquely a Korean curation on streetwear apparel, the store is one of the go to spots for international streetwear brands. In its early days however, WORKSOUT founder Seunghyuk Kang literally had to make trips to Japan in order to bring back apparel for sale in Seoul. Since then, and as hip hope culture gains popularity in South Korea, WORKSOUT has seen the fruits of its labour bear fruit. Despite this, the brand wishes to remain true to its roots, developing the sub culture by supporting local skateboarders, DJs and the many innovative streetwear brands that have been popping up both in South Korea and in Japan. Everyone knows how much of a boon it’ll be to have your apparel displayed with a leading stockist. These days however, the brand is an authority on streetwear style through its two huge boutiques. At its ritzy Apgujeong outlet, the brand has a visually inspiring facade designed by the architect Andrea Caputo. Within the premises, a towering wider staircase serves as a show space for the latest trends in footwear. The store’s interior is yet again another wonderland for modern design lovers with a mixed use of glass, wood and concrete materials to subtly segment the different brands from each other. The bottom floor however, is dominated by glass panels that ensures that every other tee or cap is always in sight. One could mistake it for an Apple store. Recently, WORKSOUT launched its flagship store in the beautiful RYSE Hotel in Hongdae, a 3-storey outpost in one of Seoul’s most trafficked districts. The interior of the space matches the modernist design focused hotel though it tastefully utilises some traditional Korean furniture to ground the store as a distinctly Korean enterprise. Apart from these traditional design elements, WORKSOUT also has a series of sculptures (if you could even call it that) that singularly represents both the rebellious attitudes of streetwear whilst also showcasing its creative inclinations and tendencies. Make a trip down to the RYSE store and you’ll know what we mean - it’s a three story haven for shopping. Amongst the carefully constructed low rise boutiques of Apgujeong, WORKSOUT style defying architecture is made to stand out. This is especially the case in a society where conservatism still informs social interaction and behaviour. WORKSOUT hence aims to show that there is a second, third and maybe even fourth way to doing things, from fashion to music and even, visual merchandising. It is through these efforts that the brand is living up to its cultural responsibility after having benefitted from the growing popularity of hip hop and streetwear culture. These stores go against the grain in an era when retailers are questioning the efficacy of brick and mortar styles. However, for the likes of Gentle Monster, Stylenanda and WORKSOUT - these physical locations are their bread and butter. The revolution of customised ‘personal shopping’ just seems so out of date. Instead of familiarity, these brands are pushing for hyper unique experiences, giving shoppers a reason to make multiple trips during each season. Despite the need to constantly reinvent itself, the quality and thought that goes into such hyper efforts at visual merchandising is nevertheless, excellent. In a country where attention spans are short and trends are replicated with lightning speed. It thus pays to take a closer look at what’s happening in Seoul - it may very well set the tone for design and fashion for years to come.